The fertile floodplains of Duba have long been known as some of the best grazing lands in the Okavango Delta, supporting herds of buffalo, lechwe and kudu- all excellent food for lion and leopard. There are just two camps on the conservancy, both excellent for photographers, making for an exclusive game viewing experience. What’s Duba Expedition Camp really like? Duba Expedition Camp was opened in April 2016 and has just 6 tents facing out into the setting sun. The main mess area is where you’ll eat communal meals in the dining room, when you’re not eating on the deck under the stars. There’s also a cosy library and communal fire pit, all looking out over a small channel, which is used by buffalo as a path to reach the nearby islands. There are three tents either side of the main mess, each built in on a low deck and facing over the floodplain. Sweeping mozzie nests and deep red rugs on the floor add a colonial feel, but the overall design here is simple and unfussy, if very comfortable. There’s a loo and shower to the rear, as well as an overhead fan to cool you and charging points for your essential gear. What can I do at Duba Expedition Camp? While the lion and buffalo interactions that made Duba’s name are no longer so frequent as they once were, the camps still have regular sightings of lion hunting lechwe through the channels by day, as well as ellies and increasingly good leopard sightings- a side effect of the fractured lion prides. 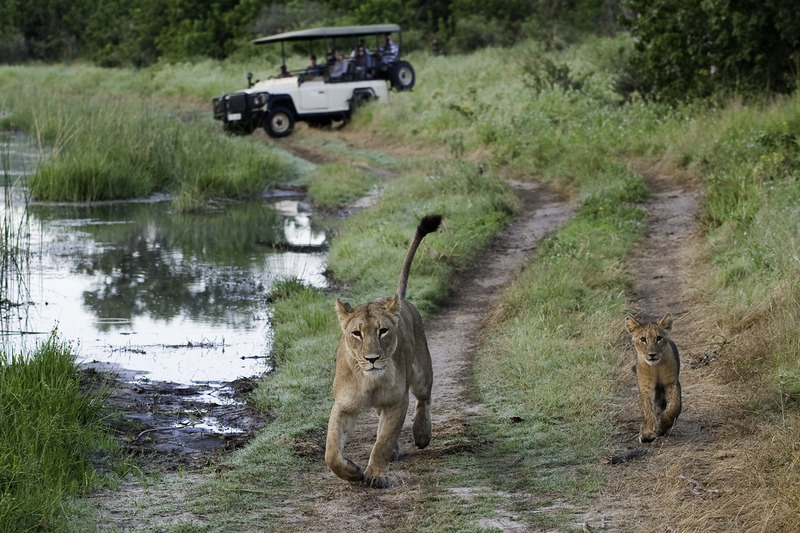 Game drives are both day and evening, usually with 4-6 guests on a vehicle and the same guide throughout your visit. The guides at Duba are particularly attuned to the needs of photographers, and you can expect them to be aware of this even on boat safari, where one of the camp boats is specially designed with photographic mounts and swivel chairs. While you don’t see cats as much from the boat, this is a great way to get hippo and croc sightings and is excellent for birders. Boating is reliant on the water levels so normally only takes place between May and October. Walking safaris are also on offer for those who want an in-depth immersion in the bush, and lastly, if you don’t want to spend your mid-day siesta snoozing, there’s also the possibility of catch and release fishing. Just as an aside, this is not permitted in January/February. Giving back at Duba Expedition Camp: Five local communities receive lease payments from Duba, and 80% of the camp staff are from the nearby area. The camp itself is run on solar power.